A new European project, inDemand, has been officially kicked-off on 18th June during the meeting in Oulu University Hospital (OYS) TestLabs. Four SMEs, which were selected from the thirteen high quality applications, will co-create novel eHealth solutions with OYS healthcare professionals. inDemand is a new model of co-creating digital health solutions by healthcare organizations and companies, with the economic support of public regional funds. 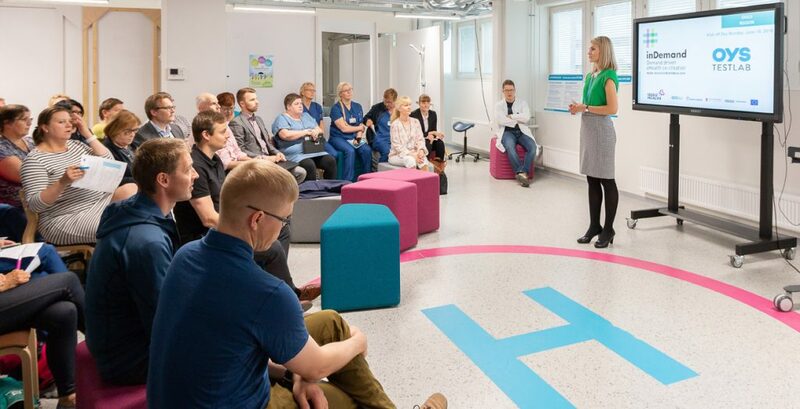 According to Pauliina Hyrkäs, Designer of Innovation Services at Oulu University Hospital, the goal of the inDemand project is to co-create new eHealth services that will meet the carefully selected and evaluated healthcare challenges. These new solutions will enable patients to be more involved in taking care of their health. Moreover, the hospital processes will be enhanced, and the cost savings in healthcare will be generated. This project applies at the same time demand-driven as well as co-creation approaches and it’s implemented in three pilot regions: Murcia in Spain, Paris in France and Oulu in Finland. The four SMEs selected to solve the Oulu Region challenges are: Buddy healthcare, Prowellness, Delfoi and Sense4Health. ‘For Sense4Health it’s important that we can co-create an application with Oulu University Hospital. This application will help small children and youth go through the diagnostic patient journey. It will also be useful for health professionals who gather the right information about patients and prepare guiding materials for them. inDemand is valuable for us also in terms of growing our business,’ said Miika Arvonen, CEO in Sense4Health. ‘First of all we need to balance technical requirements and customers’ needs. Finding the right way to meet these needs will be challenging,’ added Simo Särkkä, CTO in Sense4Health. During the kick-off meeting in OYS TestLabs, the companies received a lot of practical information on the co-creation process and business support. They also took part in a workshop to brainstorm with healthcare professionals from Oulu University Hospital. Next steps and milestones were discussed as well as instructions for the gathering with healthcare professionals. At the end, the project participants presented their company profile and initial solution proposals. ‘This project is a totally new thing for us because we were following previously the surgery care, breastfeeding care and physiotherapy care pathways. This is a completely different approach for our company. InDemand is a large-scale project and our expectations are very high. It will take some learning from us to understand the whole process but with the support of healthcare professionals, I think we will be fine,’ explained Peter Hänninen, Project Manager in Buddy Healthcare. The process of co-creation means also commitment for the SMEs that participate in this project. ‘Co-creation in the context of healthcare requires from the participating companies flexibility and adaptability as well as ability to work efficiently. In addition, the companies should be sensitive to the needs pointed out by end-users and provide enough space for the expertise of healthcare professionals. However, these skills can be learned and most companies usually feel that co-creation is an inspiring and very useful way of developing their products,’ concluded Pauliina Hyrkäs. Next these SMEs will go through intensive six months of the co-creation period. The goal is to develop ready solutions by the end of 2018. Heini Malm, Senior Advisor of Business Development, highlights that SMEs will receive business support of maximum 30 000e from the Council of Oulu Region for business modeling and developing their solutions. In 2019, OYS will select new challenges and the next call for SMEs will open.